Bicycle Retailer is one of the top periodicals serving the bicycle industry and always works hard to keep the industry well informed and up to date on all the latest happenings. 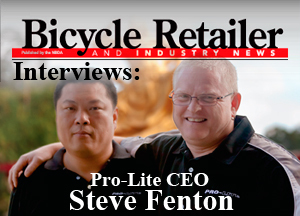 With the importance of Taichung Bike Week increasing every year and the important role played by event founder and Pro-Lite CEO, Steve Fenton, we were very glad to read this writeup giving a bit of history about the guy who turns the wheels behind the scenes here and we hope you are as well. Reprinted with permission of Bicycle Retailer.